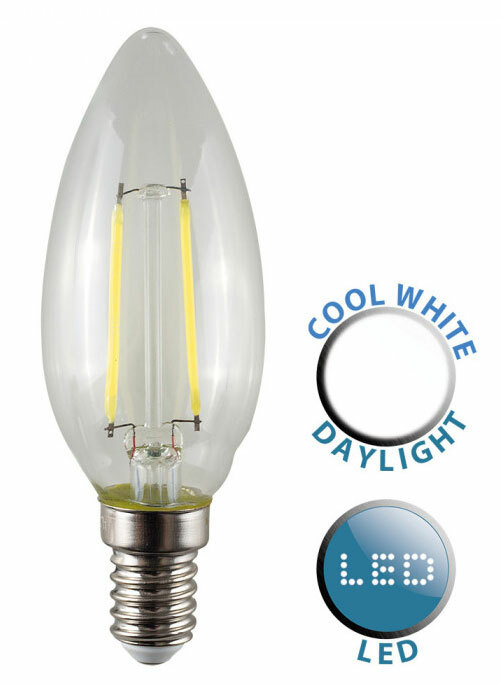 This 4w SES – E14 filament LED candle bulb in daylight white and 440 lumens is a direct replacement for a 40w incandescent candle lamp. Daylight 6500 kelvin and suitable for any light fitting. Best suited in decorative chandeliers and bare lamp fittings, this non-dimmable LED candle bulb is energy efficient and bright. The light produced is very white daylight that is great for task lighting. It does not contain infra-red or ultra-violet light or give off a great deal of heat. The light is uniform, with a 360° light spread so you can save money and electricity.